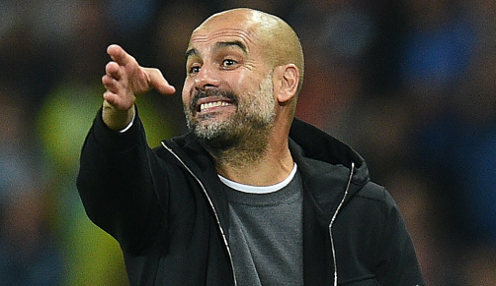 Manchester City boss Pep Guardiola said he enjoyed one of his happiest days in charge when his side came from behind to win 2-1 at Hoffenheim in the Champions League. The Citizens went into the Group F encounter needing a result following their shock 2-1 defeat against Lyon at the Etihad Stadium in their opening game last month. However, they were trailing after just 44 seconds when Ishak Belfodil fired the German Bundesliga outfit in front. Sergio Aguero responded quickly for City with an equaliser on seven minutes and David Silva pounced on a mistake by defender Stefan Posch to score an 87th-minute winner. You cannot go through to quarters, semis, without living these situations. That's why today is one of the happiest days I've had in this club because it's going to help us. Lyon's 2-2 home draw against Shakhtar Donestk means City are just a point off top spot with four games remaning and Guardiola was delighted afterwards. He said: "After one minute we conceded and it's not easy, but after that we fought, as always, as a team. "The previous two seasons were not simple, but we qualified with games left and this time it's not going to happen. Guardiola, who refused to discuss the match officials afterwards despite being unhappy with a couple of decisions during the game, also singled out Aguero for praise afterwards. The Spaniard said: "He is one of the best players I have trained in my life. "I am a lucky guy to have many of them who are top players at Barcelona and Bayern Munich and he is in that list. "In terms of mentality, I love the players who in the bad moments step forward and say 'I am here guys' and he is one of them. "I am so happy for him. He deserves all of my respect." City are now 1/100 to win Group F, while Lyon are priced at 33/1.